Bi-metal, soft-point bullet. Berdan-primed, non-corrosive and non-reloadable. Wolf Polyformance, 7.62x39mm, SP, 125 Grain, 1,000 Rounds is rated 4.8 out of 5 by 31. Rated 4 out of 5 by john w from they look great. well packaged, quick shipping. for lots of plinkin great price. Rated 5 out of 5 by Scoon from Great Deer hunting round Dropped a buck in his tracks at 141 yards, didn't take another step. Accurate out to 200 yards, thats as far as we have shot it. Great cheap round to feed our bolt guns. Rated 5 out of 5 by THE DUDE from GREAT PRICE THE BEST I'VE EVER BOUGHT. ALL THEIR PRODUCTS I'VE USED SO FAR, FAR EXCEED MY EXPECTATIONS. NOT EVEN ONE MISFIRE YET. AMAZING!!!! !THEIR PRODUCTS JUST MADE ME WRITE ALOT MORE THAN I USUALLY DO. Rated 5 out of 5 by Barbarosa from DEER KILLER!! Using my Galil Ace after sighting in its optic and then running of about 400 rounds of Wolf FMJ, this past fall I loaded my Ace up with Wolf SP 7.62X39 ammo and placed a shot just below the right shoulder of a VERY nice and VERY large buck (and the deer here in Western Wisconsin are sizeable). Anyway, the deer did a 180 degree turn and dropped where it stood probably never knowing what happened before he went to wherever deer go when they provide us with their flesh. The round flew true and hit hard and when I cleaned the deer I found that the entire top portion of the heart was blown apart and both lungs were blown. The round exited the other side of the deer but it had apparently mushroomed to quite a large size judging by the size of the exit wound. The performance of the round looked no different than that I had previously obtained using a Marlin lever action 30-30 AT LEAST. 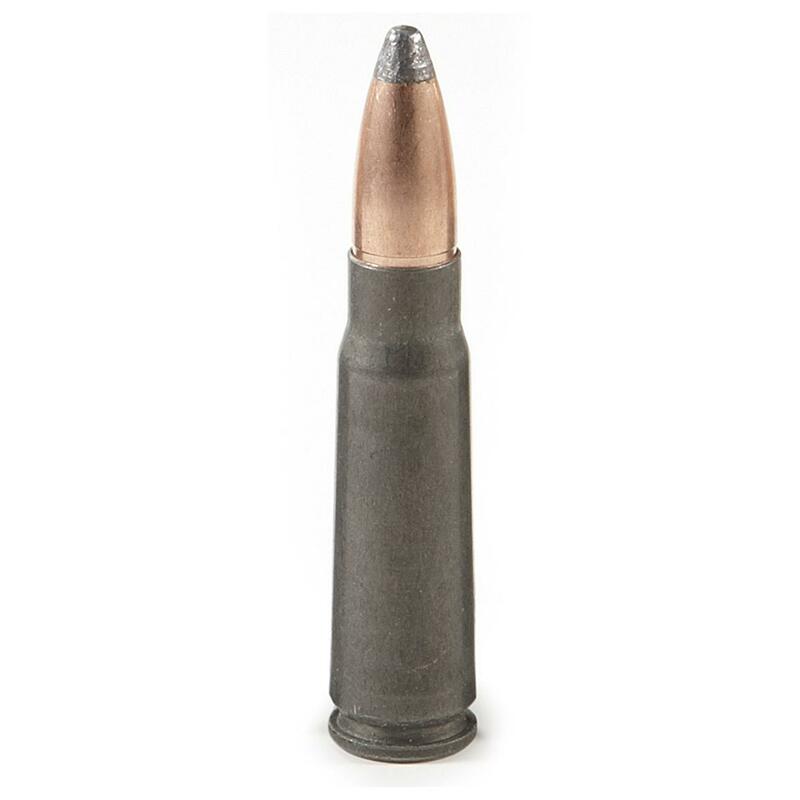 These Wolf SP rounds appear to be fantastic hunting rounds and I was frankly amazed at the terminal performance of the soft point 7.62X39 Wold Polyformance round. Also when zeroing the 4X scope I was using I was pleasantly surprised to find that I could 5 shot after 5 shot obtain 1-1.5 MOA groups. Also ran a few rounds through an Arsenal SAM7 AK47 I owned and using its scope rail and a 3X9X30 scope I could almost equal the shot groupings I managed with the Galil Ace. 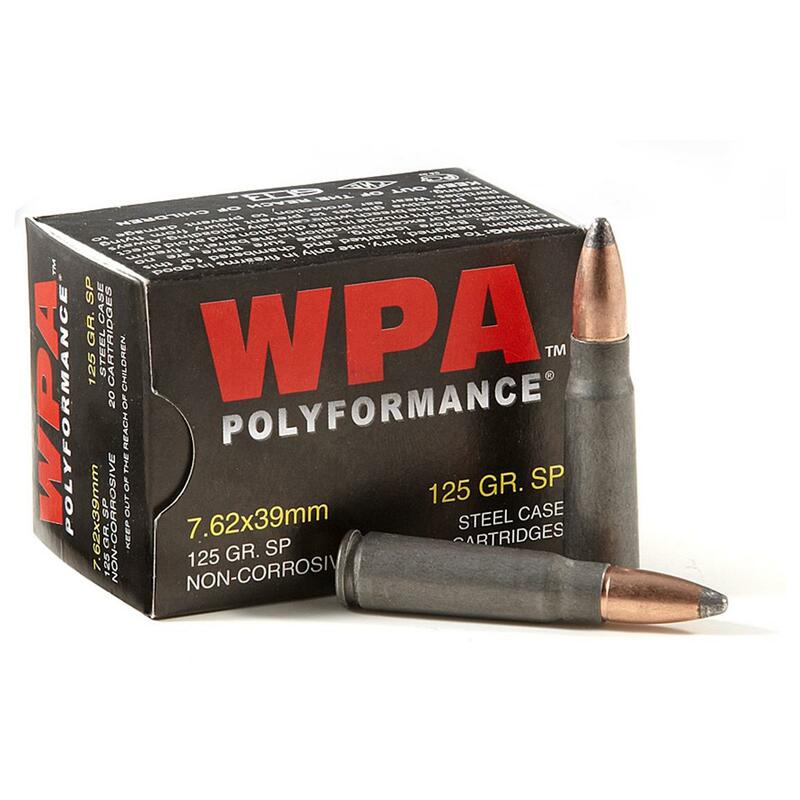 Folks, this is simply GREAT ammo and you can forget about scrounging for spent cases and just let the steel cases oxidize and return to the earth from which the steel cases came from. Great ammo at a superb price delivered with ROCKET speed and packed extremely well by the superb people at Sportsmansguide. Want a tip? Join the Buyers Club.....worth a lot more than its modest cost! Rated 5 out of 5 by lewis from Great buy also free shipping. The wolf ammo shoot great in my ak47 and sks no misfire. Rated 5 out of 5 by Batman from Will buy more!! Took my AK to the range had absolutely no problems with anything. Sportsman Guide continues to give us Great products to buy on the 4 month payment plan. Can"t beat them! Rated 4 out of 5 by Paulie54 from Fantastic Price! Bought 1000 rounds to augment my cache of AK ammo. Never had any problems with Wolf ammo.